Here's my container garden...have a few ??? So, first of all, I'm new here. I've tried to grow a few herbs and other plants in the past but I've never had much of a green thumb. I was determined this year to actually succeed with some herbs, tomatoes, and peppers though and so far, it's gone fairly well (especially the herbs and my peppers and tomatoes I started from seeds)...however I have a few issues. This has been a very strange summer in Northern Ohio (I think most anyone in the East knows what I mean). It's been very cool for us (we've had quite a few days where the high hasn't even made it out of the 70s - we're usually in the mid 80s almost all the time) and, at least in our little neck of the woods, it's also been very dry. Since I'm growing in containers though, it's not too hard to keep things watered. That gets me to one of my issues. Here's a picture of part of my garden. Also, one other issue that I'm wondering about. I have poblano peppers growing and there's two that looks VERY nice - but I want them to ripen fully and I'm not sure if they are or not. I've read they'll turn dark red or almost black, and mine are still a nice deep green (I've never seen one in a store that was anything but this color, so I have nothing to go by). Do some particular poblanos just never quite get to that dark color that I've read about when they're fully ripe? (The tag from the store said "Poblano - Ancho." I know an ancho is a dried poblano, but I wondered if perhaps there are specific hybrids of poblanos and "ancho" actually means something as far as that too.) There are only two on at this point and for some reason I'm not seeing more coming on yet (I've had blossoms but most have fallen off...maybe something to do with the wilting?) so I don't want to just pick one and see, lol. Thanks in advance for any advice you can give me. It's amazing my garden has come this far since I've proved in the past I'm very good at killing plants but not so good at keeping them alive! Those are some NICE looking peppers! I too have a potted only garden. From what I've noticed with my own Oregon Spring tomatoes (we're growing him upside down for fun) Some of the leaves are starting to curl and crack, which signifies they arent getting enough water. The leaves that are doing that haven't recovered, yet we're still getting a ton of healthy fresh foliage. They perked up after I irrigated by poking a thin metal spike so oxygen and water could reach the bottom of the pot they're growing out of. The main reason behind this I think at least in my case is they're competing for root space with my bell peppers growing above them so I imagine it could be the same in your case, I noticed your tomato's leaves are curling pretty bad. If one is available you may need a bigger pot. For sprucing anything up make sure you arent just using straight dirt, try to get some kind of organic (if possible) fertilizer. Garden stores sell all kinds of tomato specific fertilizers. 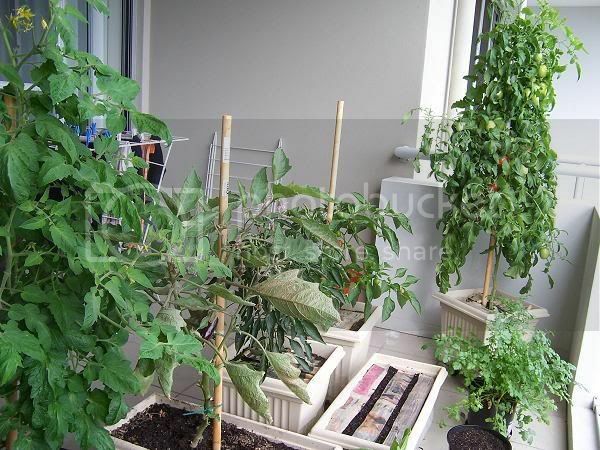 That pot looks very small to support a tomato plant, let alone two. My first year growing tomatoes, I was doing them in 3-gallon pots, and those were too small to have really healthy tomatoes. I wouldn't try again with anything smaller than a 5-gallon pot, and I really prefer 6-gallon or bigger. I don't know how much transplanting to a bigger pot will help at this point in their growth. It might be a shock to them, and I suspect the plants are pretty badly root-bound by now. Since you are getting some yield, I'd personally probably leave them as they are and take it as a learning experience. Next year, though, I'd definitely invest in bigger containers, and stick to one plant per container. it will be obvious when the poblano changes color. red ripe poblano is one of my favorites. thoughs are amazing peppers, i have always wanted to try peppers, how long did it take for your pepper to look like that? You still got the whole rest of the summer until frost. If the tomatoes are indeterminates, I would go ahead and repot them into a wooden 1/2 barrel or, even better, a giant glazed ceramic pot, using at least 1/3 compost. I always use a mixture of unscreened compost with all the sticks, etc., gravel, and sand in the bottom of the pot, then a home made potting mix of 1/3 1"-screened compost, 1/3 good garden soil, 1/3 sand, fortified with greensand, rock phosphate, oystershell chicken grit, and dolomitic lime. I would also bury the plants at least 2" deeper. 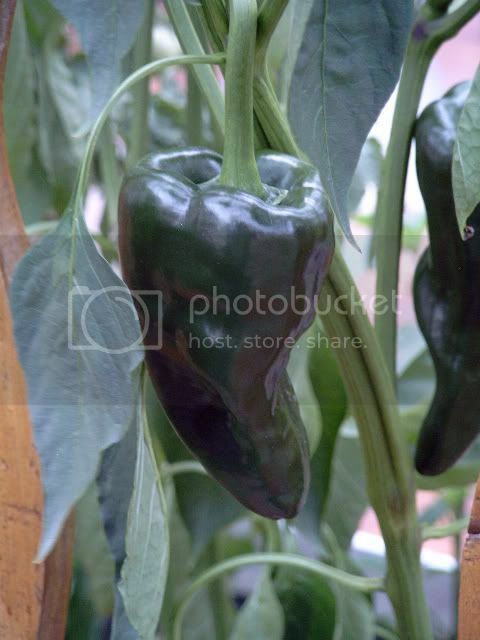 That IS a beautiful looking pepper -- I see you've used the photo for your avatar. Good choice! But your plants seem stressed especially the tomatoes. You said the blossoms were falling off your pepper. That is another sign of stress. It may be too hot on the deck. You may think it's nice out but the sun still beats down on them all day. Not to mention like you said the surface of the deck will reflect heat making it hotter up there. It wouldn't hurt to put a light cover on them for a while each day. And see what happens. I too have an all container garden and it's amazing how much you can produce in such a small area! SP8 - Awesome looking plants you've got going there! I'm jealous! And Rambo 09 - we bought the poblano plant back in mid May I think. Those peppers came on almost a month ago I think - I've been waiting for them to darken more but it hasn't happened which is why I was wondering if they might not. Really other than giving them water and some Miracle Gro timed release food a while back, they haven't gotten any other special treatment. Probably one of the easier things I've grown besides my thyme and rosemary really (I think if you can't grow thyme and rosemary, you might need to give it up, lol). 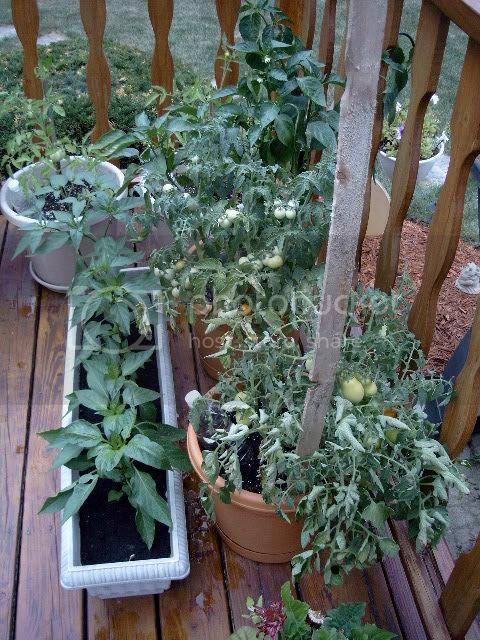 Actually I grew cayenne peppers a few years back and those grew very well in a container as well, with little effort. Dried them and the suckers were hot as the devil too. Anyways, most people seem to be saying that they think the pot is too small. That makes perfect sense and actually, if I could reasonably replant them at this point that sounds like a pretty good idea. But I don't know how well it'll work out. Definitely won't plant as much in the containers next year. It's kinda deceiving too - the pot is bigger than it seems in the picture but definitely nowhere near the sizes you're talking - I forget, 3-4 gallons I think it is? 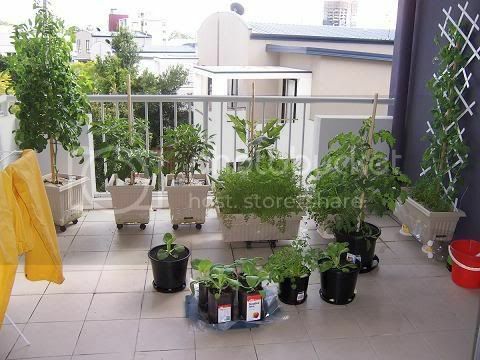 I could easily shift the plants around on the deck so that they wouldn't get full sun as long. Where they are in the pictures is actually where I had moved them just a day or so ago so they wouldn't get the full early morning sun, but they will still get it the rest of the day. I could move them to the other side of the deck and they'd get full sun for only about 7-8 hours. Maybe better? I thought tomatoes and peppers needed full sun for nearly the whole day to actually bear fruit, but if the shade would help it's easy enough to provide. The tomatoes are definitely in way too small a pot. Usually one tomato plant in a five gallon bucket works best. But at this point it looks like they might have some kind of wilt, ie fungal disease. (Otherwise they are just really wilted from being hot and dried out.) One reason for not crowding plants together in a pot is that it aids in the spread of disease. If you want to try to save them, I'd go ahead and separate them - soak the soil in the pot real well and then you should be able to gently pull the roots apart. Then set them in their new pots and water well. Then spray the leaves with a milk and water solution, which works as a fungicide. Then just keep your soil evenly moist (not wet, not dried out) and see what happens. Peppers do well in hot weather. Tomatoes like full sun until temps get above 85 at which point they start getting heat stressed and prefer some shade through the heat of the day.